I’ve adjusted it some to suit my needs and tastes. 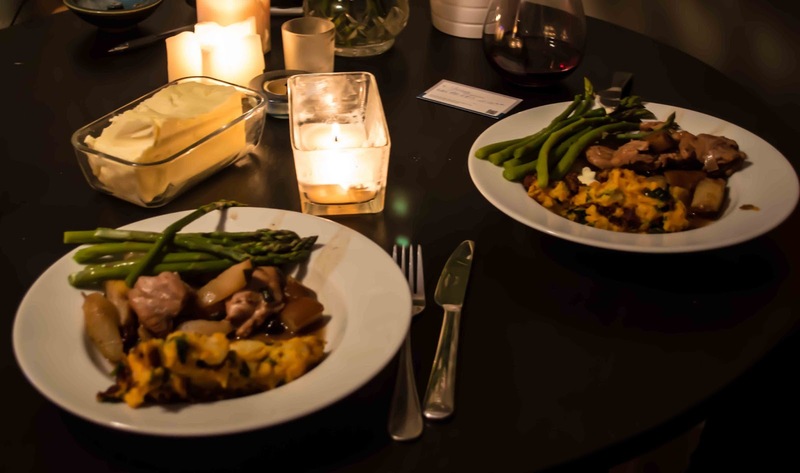 6 chicken breasts halves boneless and skinless – I use boneless chicken thighs. 1 shallot or green onion, chopped – I did the recipe once like this and now use 4-5 shallots(or green onions) – I think it makes the whole experience better – far better. 2 medium fresh pears, peeled, cored, and sliced – I use 3-4. Usually ‘harder’ pears are better although I’ve used both – sometime a couple of different types in one dish. 1 cup chicken broth or stock – I had to use beef broth once and it was not a problem – it actually tasted marvelous. 1/4 cup dried tart cherries – I use cranberries, more like 1/3 to half a cup. C’mon really! I have found that it is wise to prepare all the separate parts of this recipe … well, separately. Prepare chicken, cut up pears, prepare the sauce, cut shallots before you start cooking anything. The reason for this is that you want to stir as you go and if things are not prepared, well, timing is off and things may burn. Pat chicken dry with paper towels(if you want). You can hammer the breasts/thighs flat or as I do, just cut ’em up to sizes that you like. Season on both sides with salt and pepper or just throw in the seasoning in later when you add the sauce. I won’t tell. In a large frying pan over medium-high heat, add the olive oil(and butter – butter is really good for you). When the oil is hot, add the chicken and sauté, turning once, for 3 to 4 minutes on each side, until golden brown. If you are really good at it … or do as I do and just stir until they are browned all over. Remove from heat and transfer to a platter, cover, and keep warm. 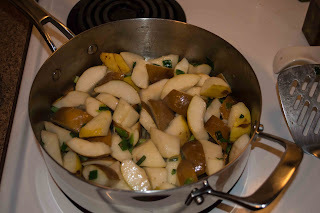 To the same pan, add the shallot and sauté over medium-high heat for 2 minutes or until soft(I usually add a touch more butter and oil before I add the shallots and stir lots so there is no burning; decrease heat to medium and add the pears. Continue sautéing, stirring occasionally for 3 to 4 minutes, until the pears are soft and golden brown. If they are not completely soft, don’t worry you are going to cook them more with the chicken so… I don’t like them too, too soft so…. To prepare the sauce, combine chicken broth, balsamic vinegar, sugar, and cornstarch in a small bowl. Pour over the pear mixture; add the cherries. Increase heat to high and simmer, stirring frequently for 6 to 8 minutes or until the sauce thickens slightly. (Again, prepare this before you start actually cooking.) This is usually where I add the salt and pepper as I have forgotten to add earlier. Not enough carbs in here for me so a few sweet potatoes or yams done in the oven are perfect on the side or some left over stamppot. We also had some delicious steamed asparagus with this meal.